San Pedro is a port town, a working man’s town. Some say it‘s a gritty town. I don’t disagree but San Pedro is far too complex for any one label. It’s a town close to the sea and when you approach the city from the 110 the lights from the harbor guide you in and when you land into the town it’s like you’re in a secret town. I took Pacific Ave and saw a taco truck at 1st street. There were no customers so I kept going. I saw another truck at 14th St but kept going for the same reason. Then at 17th St I saw a truck parked in the lot of a car wash with a crowd of people. When you're in a unfamiliar town you trust the locals. I ordered my tacos (suadero, al pastor, and carne asada) and waited for my number to be called. Then a police car pulled into the lot and I thought - oh well the fun is over. I thought maybe someone in the neighborhood complained or there was just some arbitrary ordinance to enforce. But to my surprise the policeman said nothing of the kind. Instead he ordered a plate of tacos in Spanish. The tacos and the salsas were solid. The suadero was pork rib with a flavor similar to carnitas but with a texture that was soft and tender. 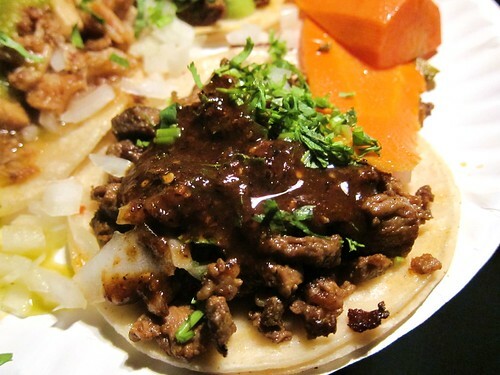 The carne asada, nice and greasy with little charred bits of steak. I topped the al pastor (not cut from a trompo) with a guacamole and cilantro salsa to liven it up. 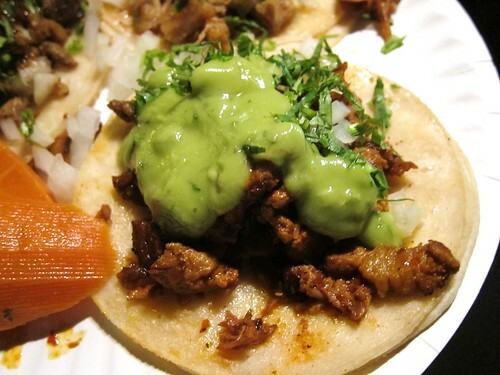 You garnish your tacos from the containers on the counter and the squeeze bottles of salsas. Besides onions and cilantro they had a jalapeno/carrot mixture, limes, and radishes. The salsas (verde, avocado, and a dark guijallo chile salsa) were all very good. 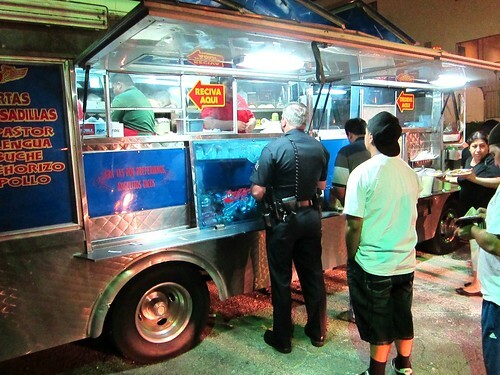 After finishing my tacos I cruised around Gaffey St looking for a truck that parked at a Chevron gas station. It was a vague tip I received quite some time ago. 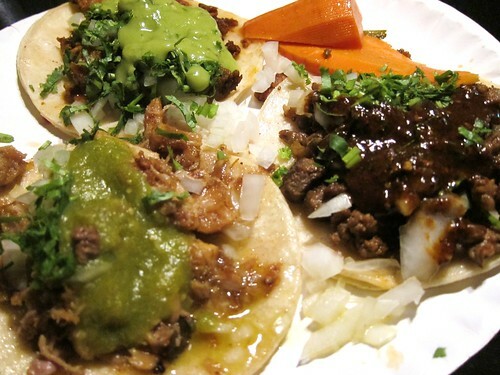 Try the tacos on Gaffey at the Chevron the message read. 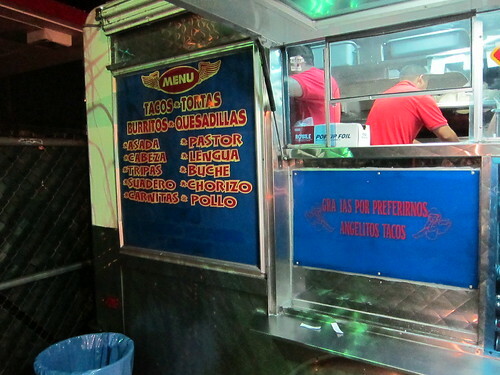 But I didn’t find any taco trucks on Gaffey and I was starting to worry about time. It was 10pm and I needed to get back home and write this post.